Who doesn’t want to be brave? But, how easy is that, especially when facing a deadly disease? Hollye Jacobs gives new meaning to courage in her Silver Pen blog and book, The Silver Lining, with her positive approach to dealing with her cancer diagnosis. This nurse and social worker learned at 39 that she had breast cancer. When I saw Hollye on CBS This Morning, I was struck by how full of spirit she was when talking about tackling her difficult medical situation. 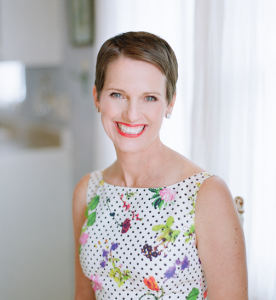 This month she launched a second book, The Silver Lining, A Companion Guide, which Allstate is giving away for FREE to every person diagnosed with breast cancer this year! For more info click here. STACEY: You had a double mastectomy and reconstructive surgery. Here you are three years later. Where are you at now? HOLLYE: I’m doing great! As most people who have been through rigorous treatment will acknowledge there are lingering side effects of fatigue. I get tired easily which is nothing compared to where I’ve been. I am running again, doing yoga just about every day, feeling as good as I can possibly feel, which is fantastic. I feel grateful each and every single day that I am able to get up, that my legs are able to move. The memory of being unable to do those things is still more than half a second from my mind. I have this profound gratitude for where I am today. STACEY: You took something and turned it on its side and said this is how I’m going to live my life. Now, before cancer, what was going on in your life? HOLLYE: I was a happy, healthy, primarily vegan eating, marathon-running 39-year-old mother with no family history of breast cancer. Being diagnosed was pretty earth-shattering. I was doing clinical work, taking my daughter to and from school, just living a terrific life. I’m still living a terrific life; it’s just been altered in ways I could not have imagined. 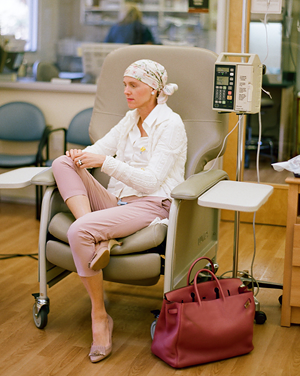 STACEY: I’m wondering if you thought about cancer at all before being diagnosed? HOLLYE: I thought about it on a daily basis. My career as a nurse social worker and child development specialist was in the field of hospice. I cared for adults and children who were dying from cancer every single day. I was very familiar with the world of oncology and saw cancer really at the end of life. I think one of the great perspectives that I had when I got the diagnosis was to say this diagnosis could have been so much worse. STACEY: Do you ask why? When you say you were a vegan, marathoner and with no cancer history, why did you get it at 39? HOLLYE: I see people get mired in the question “Why?” when there really is no answer to it. I wasn’t going to get an answer or one that I wanted, so I needed to refocus my energy and effort in taking that next step and moving forward. “Why?” is a natural thing to ask. 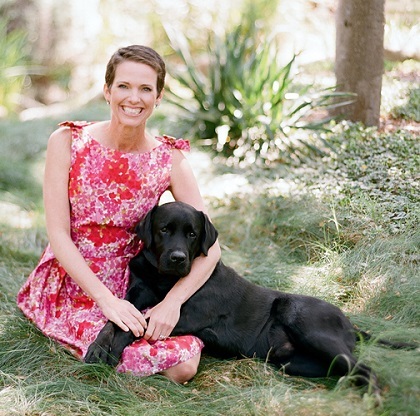 STACEY: You think you are doing all the things right, but cancer doesn’t discriminate. HOLLYE: One of my oncologists did say that when you consider how healthy your lifestyle was before the cancer diagnosis, one thing to think about is that maybe your diagnosis didn’t get much worse because of how healthy you were—a real silver lining way to look at it. STACEY: Were you always someone who looked at the silver linings in life? HOLLYE: I’ve always been a ‘half-full’ kind of girl. But the cancer diagnosis and its treatment challenges every bit of that half-fullness. It’s easy to be half-full when the most challenging aspect of your day is what to make for dinner, or how am I going to fit in all the things I have to do in a day. When I think about and talk about the silver lining, it’s not Pollyanna, “everything will be fine.” Not that at all. Silver linings come in big and small packages—everything from watching a hummingbird outside my window, or a cup of tea that eases my nausea just a little bit. The silver linings, the little things in life, help provide a balance and perspective to help you see what you do have, rather than what you don’t have. STACEY: Those little things add up even when we don’t necessarily have something daunting, right? HOLLYE: Yes, the silver lining philosophy transcends illness. It applies to every aspect in our lives, whether you are sitting in traffic or having a bad day. The thing I learned without a doubt is that silver linings are always present. All we have to do is look for them. One day I was having an absolutely awful day. I was literally too sick to get from the bathroom to my bed. So I lay down on the bathroom floor. STACEY: I will go out on a limb and say you were a very good nurse. But, now you were the one who needed the care, the patient. How receptive were you to that? Or more personally, “What would I say to a friend who was newly diagnosed?” The first thing is to breathe. Breathing sounds easy but after you hear the words “you have cancer” it takes a whole lot of work. My first thought was that patients forget everything they hear after they hear the words, “You have a tumor.” So I told myself to start writing everything down because I was about to forget everything. STACEY: You are a nurse and understand what it’s like to be a patient with cancer. You had almost too much knowledge and that took you in an unexpected direction. HOLLYE: Exactly right. In telling close family and friends about my diagnosis, I actually sent an email. It wasn’t the most personal way, but I was too overwhelmed with the number of people I wanted to tell. And I’m a wee bit of a control freak. I wanted people to hear about it from me in my own words. That was the impetus to start The Silver Pen blog. It was really to keep everyone apprised of what was going on. STACEY: Was it therapeutic getting your feelings out there too? HOLLYE: It was in a way that I was able to really have connections with people through the blog. The unexpected silver lining was that the blog went viral and people from all over the world were emailing me saying that I was giving them words for experiences they had no words for. I also didn’t want to read about or write about cancer every day. So I also write about travel, books, restaurants, recipes, child development and even fashion. STACEY: Why do you think blog caught on like wildfire? HOLLYE: I think it had a lot to do with the fact that I was taking it from this very behemoth disease and overwhelming experience and into a bite size, informative, relatable place. 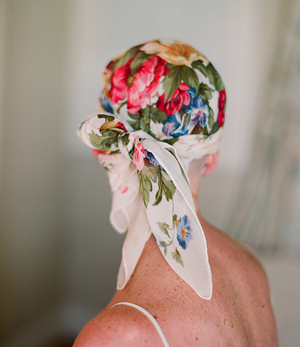 It was relatable because it was purely about the experience of living with breast cancer. I was writing from both sides of the bed as a clinician as well as a patient. STACEY: I wonder if you wouldn’t have wanted something like this for yourself. 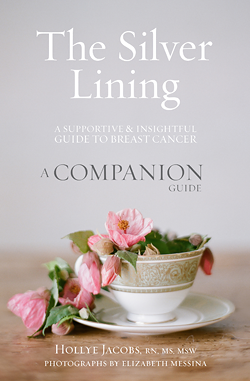 Now you are providing it for everyone else in your blog, as well as in your book, The Silver Lining, An Supportive & Insightful Guide to Breast Cancer. HOLLYE: When I finished treatment, the blog I thought would be done. But, I still had things to write and people still wanted to read. So, I just kept going. STACEY: How fantastic! When you think about your transformation, how have you changed? Or have you? HOLLYE: Absolutely. Life is now divided into before cancer, during cancer, and after cancer. I think anyone who’s had it knows that when you are faced with your own mortality, you gain a different perspective. For me it truly is the ability to be fully present. I was not able to do that before. I tried. Now I know life can change on a dime. I saw it with my patients and then experienced it personally. It really has motivated me to be fully present and appreciative of this life that we have. STACEY: How do we take on that attitude without something like the cancer diagnosis and facing mortality? HOLLYE: One thing I learned along this path is that every one of us will have or have had pain or tragedy in life. It is inherent in life. My cancer diagnosis is someone else’s divorce, someone else’s job loss. Pain itself is pain. We all have this ability to look for and find a silver lining. It’s the small things. We’re all recovering from something. That happened to be my particularly painful life experience and I learned how to find the silver lining, sometimes it was hour by hour. STACEY: I know you have an aversion to the phrase ‘fighting cancer.’ Why? HOLLYE: Fighting was never something I did or intended to do. When I heard “Hollye, keep up the good fight‼” it was not how I rolled. So, if I didn’t fight, what did I do? I harnessed positive energy. STACEY: I have to say that the silver lining for me is getting the chance to hear your story and meet you. Thank you so much for sharing your journey. I’ll be looking for silver linings daily! Be sure to check out Hollye’s blog!